bl.uk > Online Gallery Home	> Online exhibitions	> Asia, Pacific and Africa Collections	> The Balla-Hissar. Caubul. 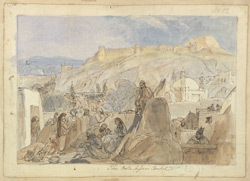 This is a pen-and-ink and water-colour drawing of Kabul in Afghanistan with the Bala Hissar in the background by James Atkinson (1780-1852) dated 1840. Inscribed on the front is: 'The Balla-Hissar. Caubul.' The drawing is folio 18 from an album of views in Afghanistan from the Kyber Pass to Kabul by Atkinson. During the First Anglo-Afghan War (1839-42) Atkinson served as Superintending Surgeon to the Army of the Indus, a combined force of British and Indian troops. A talented amateur artist, he took the opportunity to complete many sketches en route which portrayed mountain passes, rocky gorges and arid plains characteristic of the country. Kabul is located in a strategically important position at the confluence of major lines of communication running north into Central Asia and south and west into the northern plains of India. In 1504 Kabul was captured by Babur, the founder of the Moghul Empire. It was later transformed into a thriving cultural city when Timur Shah made it his capital in 1772. In the 19th century, Kabul was the focus of British, Persian and Russian rivalry for the control of the Khyber Pass. It was twice occupied by British troops (1839-42 and 1879-80). The Bala Hissar is an ancient citadel, home to some of Afghanistan’s most important kings. It occupies a prominent postion to the south of the city. The fortress was originally divided into two parts: the lower fortress contained three royal palaces, stables and barracks and the upper fortress housed the armoury and dungeon of.